Brian Andres asked me to do a painting of Sericipterus wucaiwanensis for his PhD thesis, and here it is; killing a puny and pathetically weak pterodactyloid. Give me an open quote! Give me a close quote! Oh, just you wait you big mean rhamphorhyncoid. 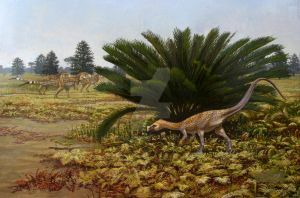 One day the pterodactyloids will be the dominate group of pterosaurs. Just wondering, could pterosaurs (like this bloke) really use their manual claws to create injury (like in this depiction)? Finally! Ever since I learned Sericipterus existed I wanted to see this! 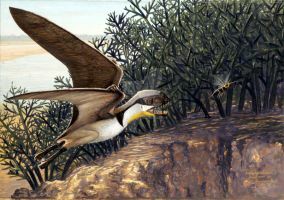 dont really see pterosaurs eating each other, ever! Hey John. Love your work. Any chance you might release this as a paid-for print for me? This is really cool. Nobody ever draws pterosaurs hunting each other. Looks almost like a Japanese print- Very cool! It isn't small. It's the size of a bald eagle. Realistic shading and texturing, but outlining too. I really like it. What inspires your pterosaur coloration and markings? Awesome! I love your color choices. That is a frightening little sonofabitch and no mistake. Any chance of a skeletal reconstruction? I like the "muchaesque" of the drawing. Really nice. On the ground, too! Nice. The one looks decidedly happy not to have been caught. Maybe it's the Judas pterodactyloid. I'd be happy too--it looks nasty!